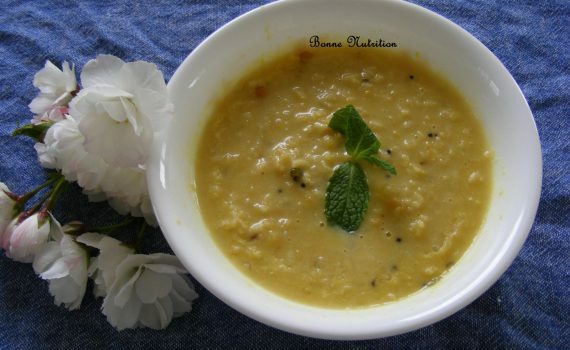 Pongal is both a festival as well as a dish. In Tamil Nadu (a state in South India)it is the “harvest festival” and the dish is made on this day(I suspect, that is why they both share the same name)! There are actually two versions to this dish-the sweet one(sakkarai pongal) and the spicy one(khara pongal). 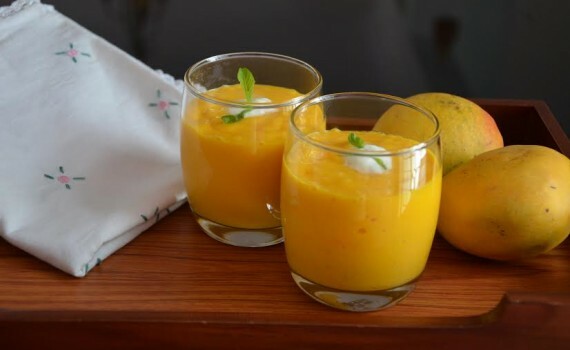 As a kid I would insist that my mom made only the sweet pongal(blame my sweet tooth for it) and subsequently, I almost forgot what the spicy version tasted like.It was much later when I started my career as a Dietitian,that I was re-introduced to the khara pongal, as it was on the breakfast menu for the patients.Again, having rice for breakfast was new to me and I tried my best to avoid it for a while.Then my seniors decided that they had to make me try it, and one fine morning(I still remember that it was a cold, rainy, Friday morning) I was ordered to taste it.So,there was me,squirming in my seat when the cook brought me a tasting cup of steaming hot pongal and another cup of raitha. Duty called(it was a rule that the dietitians had to taste the food before it could be sent to the patients) and so I took the spoon and dipped it into the cup and took a little(I was after all JUST tasting) and tasted it-and my,my, it was the tastiest pongal I had eaten. I ended up finishing the whole cup(even though I had eaten a substantial breakfast at home) and have ever since become a pongal fan!! After that I would bug mom to make the khara pongal at regular intervals. The recipe is quite easy and if you want to up the nutritional value,you could add your favourite veggies to this rice+lentil dish.The cook at the hospital even shared a secret(that even my mom didn’t know)-just before serving the dish,mix a cup of hot milk for a nice flavour(and for some added calcium indeed)!! Vegans can omit the milk. Wash the rice and mung dal separately and let it soak in water for 10-15 mins. In the meanwhile,heat the oil in a pressure cooker, then add the mustard,cumin seeds,urad dal, chana dal, and peppercorns. When the mustard starts to sputter,add the curry leaves, the chopped ginger and the turmeric. Stir the ginger till it turns slightly brown,then add the chopped onions and the green chillies. Fry till the onions are translucent. Drain the water from the mung and rice,add the mung dal and saute for 2-3 mins on medium heat. Then add the rice and again stir for a minute. Add a little more than 3 cups of water and salt, mix and close the lid of the pressure cooker and let it cook for about 3 whistles. 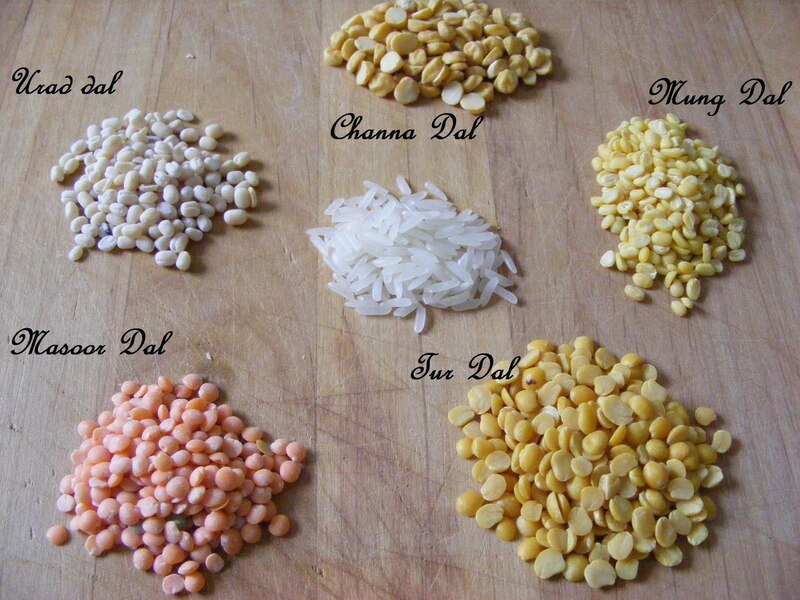 (If you have a rice cooker,then transfer the contents to a rice cooker and cook till the rice and dal are well cooked). Once it is done,mix well (the dal should be completely mashed). Just before serving mix the hot milk(optional, and check for salt) and serve piping hot with either raitha or chutney(we ate it with the tomatilla chutney ). A ‘green’ breakfast! This dish is packed with protein and makes a healthy start to your day. 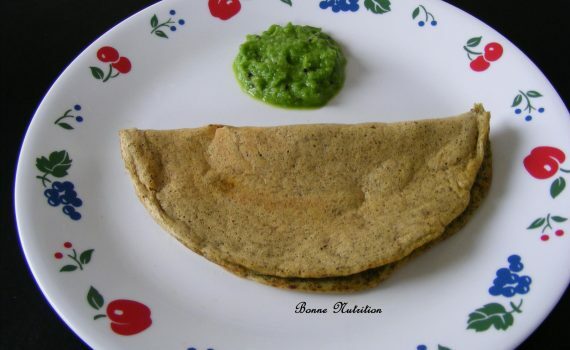 This is an easy version of the pesarattu(as there is no fermenting required).My mom learnt to make this moong dosa from one of our neighbours and as a kid I was not too fond of this ‘green’ dosa,but of course now it’s a totally different story. There are so many things that we hate as kids,but as grown ups we have a totally different take on it. The peas chutney recipe is from my mother-in-law.I had never heard of(forget tasting) ‘peas chutney’ until she had made it for breakfast one day. I had to call her up to get this recipe and she was just so thrilled about it. Green chillies: 1 or 2 nos. Add the cumin seeds and mix well. Heat a non-stick pan,when it’s hot, pour a ladleful of the dosa batter and spread. Cover and cook on medium heat for about 2-3 minutes. Remove the cover, check if the dosa has cooked.Then,flip the dosa and cook for another 2-3 minutes. Remove and serve hot with chutney. Note:It’s usually served with freshly chopped onions sprinkled on top as a garnish and some upma inside. Green chillies: 1/2 or 1 no. Grind the peas(thaw first if frozen), green chillies and salt to a fine paste. Keep aside in a bowl. Heat the oil in a pan,add the mustard,cumin and sesame seeds.When the mustard starts to sputter,remove from flame. Pour this tempering on the chutney and mix,then add the lime juice and mix well. 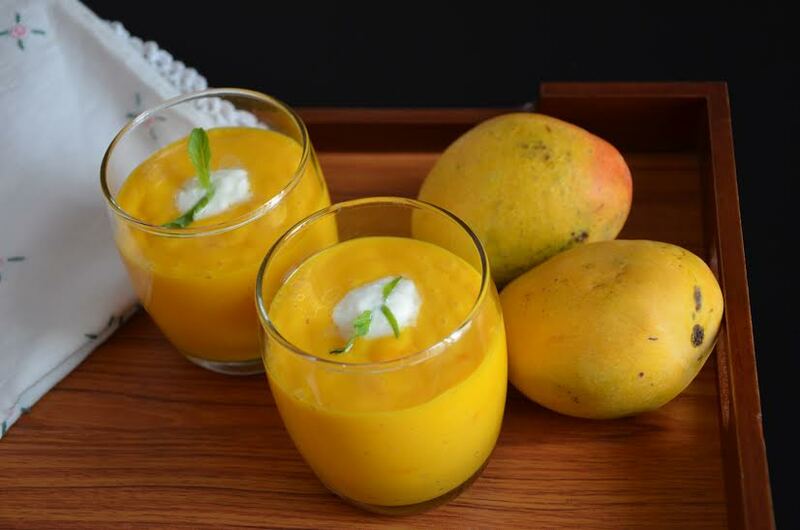 Serve with dosa’s or as a dip or use as a spread with sandwiches or wraps. Healthy eating is all about eating in moderation, and what is life without a touch of sweetness? Treat your kids to the occasional desserts, but make it a tad healthier by using fresh and less processed foods. Learn how you can add more fibre to your dosa by using whole wheat flour (regular chapathi/roti atta). Using fresh fruits like strawberries, peaches, blackberries or raspberries instead of jams or preserves also increases it’s nutritional value. Put all the ingredients in a blender and blend till you get a pouring consistency. Let it rest for 15-20 mins. In the meanwhile you can make the filling. Wash the fruit well. If using peaches, remove the skin and then slice into thin slivers. Strawberries need to be hulled and sliced into slivers. Put the fruit into a microwave safe bowl and microwave for 1-1.5 mins. Remove add the lemon juice, honey and mix well. Keep aside. Heat a pan, add a teaspoon of oil and spread it around the pan. Cover and cook on medium flame for about 2-3 mins till golden brown. Then flip it over to cook on the other side( be careful not to break it since they are very thin). Cook for another 2 mins, then slide onto a plate. Spoon out the filling into the centre and cover it with the two ends of the crepe or roll the crepe (whichever is easier). Serve with a dollop of yogurt and some maple syrup/honey. This is a favorite breakfast/snack item at home. I first made sweet banana dosa/crepes when I had a few over ripe bananas and wanted to try something other than the banana raita. This is similar to the popular Mangalorean recipe of “Southekai dosa” or ‘Sweet Cucumber dosa’. Years ago I had experimented replacing the cucumber with mango puree and the resulting ‘Sweet Mango Dosa‘ too had turned out really well. Soak the rice and methi seeds for at least 3-4 hours. Just before grinding the batter, wash the poha and leave aside for 10-15 mins. Grind all the ingredients (except the cardamom) together with enough water to make a fine batter (test the batter for sweetness). Leave aside for 1/2-1 hour. Heat a non-stick pan and pour a ladle full of the batter onto it. Spread it out in a circular motion to make a dosa/ crepe. Let it cook for a couple of minutes, then add a little oil to the edges. Flip the dosa over and let it cook till done. 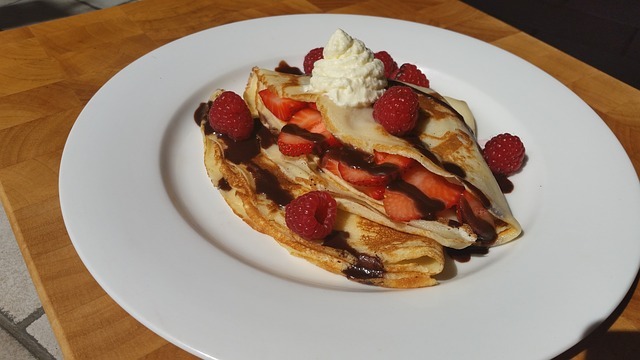 Serve the sweet banana dosa/ crepes hot off the pan and watch them vanish. 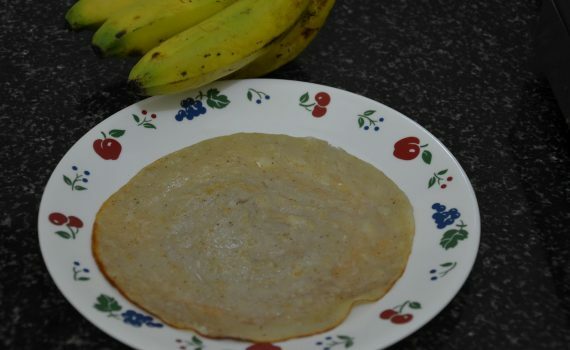 The sweet banana dosa can be eaten as such without any side or dipping sauce. Note: Store any left over batter in the refrigerator. Protein is in vogue-and why not. It high protein foods keep you feeling full for a longer period of time and also don’t raise your blood sugars like carbohydrates do. I believe in moderation and thus try to include more protein in my diet and reduce the amount of carbs without totally giving it up. I was craving for some crispy dosas as I hadn’t made them in a long time. But,with the weather no longer conducive for fermenting the batter, I had to think of something which didn’t need fermenting. That’s when my mom suggested the mixed dal dosa-or “Adai” as it’s called in Tamil Nadu. Mom suggested soaking equal quantities of all the dals/split lentils that I had at home along with equal amounts of rice. What I love about this dosa is because there is more dal (protein) when compared to the rice(carbs), this dosa is more filling and you end up eating less dosas than the regular dosa. Soak all the dals and the raw rice for at least 4-6 hours. Grind all the ingredients together with a cup of water till you get a fine paste ( pancake batter consistency). If using beaten rice/poha-soak it for 15 minutes before grinding. Pour a ladle of the batter on a hot ‘tawa’ or non-stick pan,and spread into a thin dosa. Cover for a minute,then carefully flip it over to cook the other side. Serve the mixed dal dosa/ Adai piping hot with chutney and/or sambar. When I was growing up in Bombay,Besan dosa was a very popular dish in most Udupi restaurants and was even sometimes called “Vegetarian Omelet”. 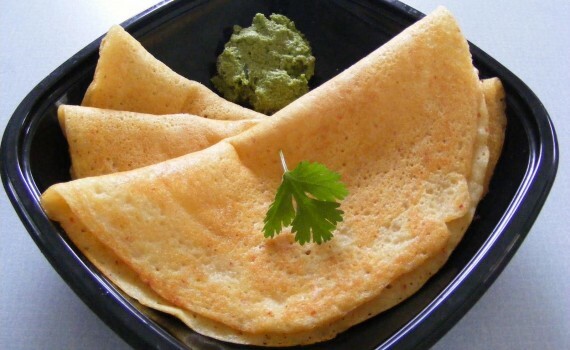 Besan dosa was also sold as a filling inside sandwiches which were named “Veggie omelet sandwich”! Funnily enough,I hated them at that time and preferred my regular ‘egg omelet’ to the veggie omelet. Finally,one day I tried it out and to my amazement, loved it(thankfully it was appreciated by hubby and little brat) and so now it’s a regular feature at home. Make sure you use a good non-stick pan when you make this-that way,you won’t need to use a lot of oil. 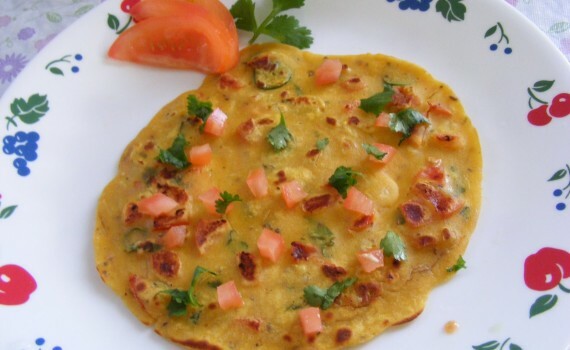 Besan or Chickpea flour is a high fibre, high protein, gluten free flour which is made from garbanzo/chickpeas. Being high in fibre, it can be helpful for lowering blood sugar levels and cholesterol. Add enough water to make a batter of dosa/pancake consistency. If adding zucchini/bottlegourd, you may need less water as the bottlegourd/zucchini will leave some of its moisture. Spread the oil on a non-stick pan on medium flame. Pour a ladle of the batter and spread like a dosa. Cover for a 3-4 minutes. Then,flip the dosa over to the other side and cook for another 1-2 minutes.Make sure not to burn them. 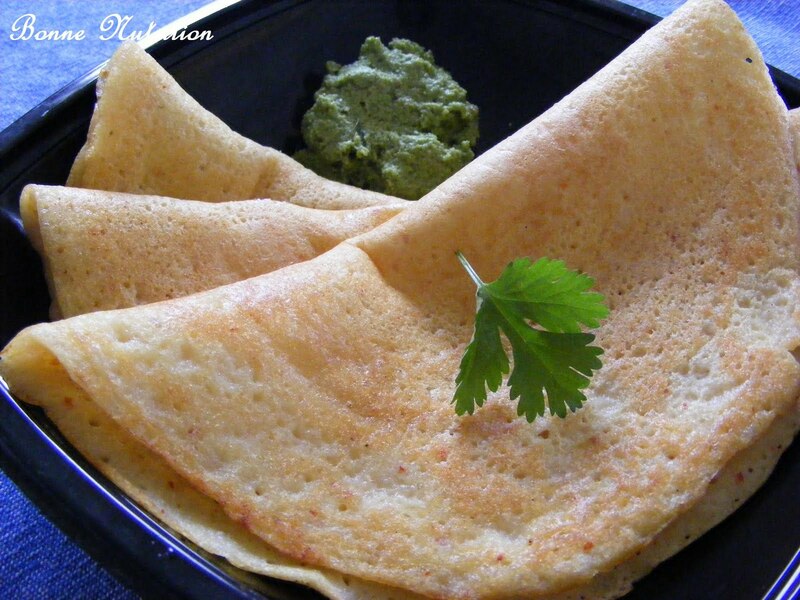 Serve the besan dosa hot with mint,ketchup or a spicy chutney. 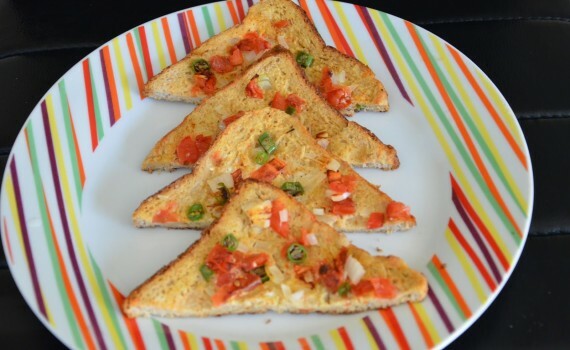 For those don’t like to eat a sweet breakfast, here is a savoury version of the French Toast-totally Indian Style! The Masala Egg Toast. Break the eggs into a bowl, add the spice powders, salt and milk (or water) and mix well. Pour a little onto a flat saucer. Heat a tsp of oil in a non-stick sauce pan. Dip the bread into the egg mixture on both sides, then place into the pan one by one. Sprinkle with the onion,tomato and cilantro on the top and flip carefully and cook till done on both sides. Serve the savoury French Toast hot with ketchup or chutney(optional). You could replace the spices (red chili, cumin, coriander powder)with green chilies.